Kenworth cabover Heavy Duty Wrecker. This truck is from aluminum and steel parts. Limited edition of 100 with ID numbers stamped in frame. Factory direct price including S&H within the United States is $1250.00. Our newest truck is made from cast & extruded aluminum. Limited edition of 250 with ID numbers stamped in frame. Factory direct US introductory price $1395.00 plus S&H. For limited time only. 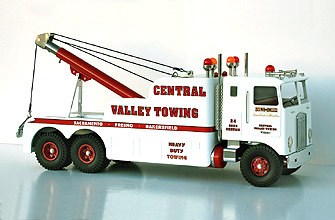 Smith-Miller, Incorporated, producer of arguably the finest toy trucks ever made in the United States, or anywhere else for that matter, has produced more than 75 different toy trucks. These trucks are serial numbered limited edition issues. They are made from new-old-stock parts, replacement parts made form original dies and/or to original specifications and newly manufactured parts, which are made to exacting standards. The trucks are hand assembled and packed and shipped in the best and probably most secure packaging available. Please explore our site starting with miniature trucks, truck parts and end with About Us and Sales Materials/Brochures. We think you'll be impressed with our quality, workmanship and customer service, thanks for visiting and come back soon. Copyright 2008-2015 Smith-Miller All Rights Reserved.